Getting ready at a hotel really works well for making impact getting ready images. Unique Moments Photography from Gig harbor Washington is there from the beginning to capture images like shown. We feel these types of images are important. They work excellent in albums as you fold page to page to see what happened on the wedding day. 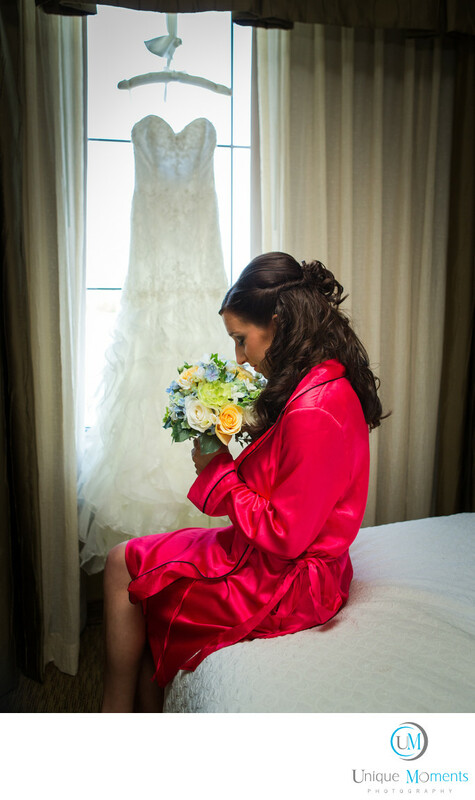 She did not know that a camera was pointed at her as she was checking out the bouquet that just got delivered. Her dress hanging in the window really sealed the deal as a stand out image. We are in the room with brides capturing images like this. Many emotional and special moments happen in that dressing room. Its an opportunity for your images to be a bit more personal. We highly suggest having our photographer in the dressing room when you are getting ready.It helps you tell the entire story. Location: 1515 Commerce St, Tacoma, WA .